While some are fascinated by the return of old school as the new school of metal, there are some places where this style has never disappeared and still remains vibrant. This includes most anywhere outside of America. But our Scandinavian metal brethren seem to have a particular love for classic melodic heavy and power metal. 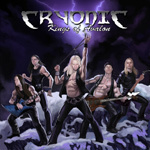 Enter Sweden's Cryonic and their second full-length disc Kings of Avalon, a huge slab of NWOBHM time-warped to our day. Cryonic channels everything from Iron Maiden and Priest to Accept to Hammerfall and Blind Guardian, and make easy work of it. Kings of Avalon cruises along with a breathtaking, roughneck speed with a powerful rhythm section, bombastic vocal arrangements (with some necessary metal shouting), and a fiery fret attack. Vocalist Bigswede has the leather lungs suitable for metal and sounds, at times, like a heavier and stronger Klaus Meine. Though their chosen genre is hardly novel and certainly predictable, Cryonic rips their way through their old school metal with energy and abandon for an entertaining experience. Best cuts include Avalon, Tear Down the Walls, Angel's Calling, and Seven Doors. Recommended! Though their chosen genre is hardly novel and certainly predictable, on Kings of Avalon Cryonic rips their way through their old school metal with energy and abandon for an entertaining experience.